Was born in Finland where he studied organ and piano at the Sibelius Academy in Helsinki and after that studied singing in Italy. He immigrated to Israel in 2004 after participating in his first International Vocal Arts Institute summer program. During these summer programs he has performed the roles of Johann in Werther (Massenet), Angelotti in Tosca (Puccini), Raimondo in Lucia di Lammermoor (Donizetti), Talpa in Il tabarro (Puccini), Caspar in Der Freischutz (Weber) and others. He also performed Monterone in Rigoletto (Verdi) and both the Marchese and Dr. Grenvil in La traviata (Verdi) in Italy. In 2005 he sang the Mayor in Dr. Miracle (Bizet) and The Representative in A Game of a Chance (Barab) in Ramat Hasharon. 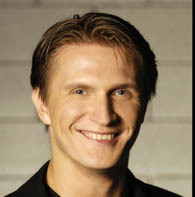 He has also performed as soloist in concerts with the Israel Chamber Orchestra. He performed with the IPO Flemmish Deputie in Don Carlo (Verdi) and the role of Count Almaviva in Le nozze di Figaro (Mozart) in the Israeli Opera's Opera Studio production with the Haifa Symphony Orchestra conducted by Tamir Chasson. Appeared as a soloist in concerts at the Israel Festival and at the Abu Gosh Festival. In 2005 he was granted the IVAI scholarship. Ville Lignell was a member of the Israeli Opera's Opera Studio where his repertoire includes Sarastro in Die Zauberflote (Mozart). At the Israeli Opera he performed Pinellino in Gianni Schicchi (Puccini).